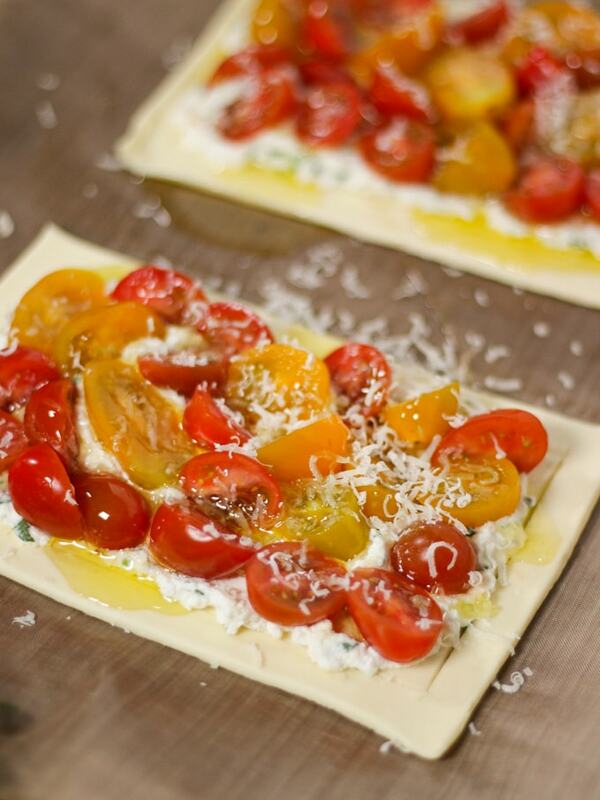 Golden pastry topped with tomato and ricotta, this delicious savoury Puff Pastry tart is the perfect mid week dinner. It is also suitable for vegetarians so makes a great Meat Free Monday recipe. AS ALWAYS, THANKS FOR SUPPORTING TAMING TWINS. I’m making a real effort at the moment to try and add more vegetarian meals into our diet. My weekly meal plans have shown me how rarely we have a meat free day. In an effort to save money, eat more veggies and help the planet I’m on the case of the easy vegetarian dinners! 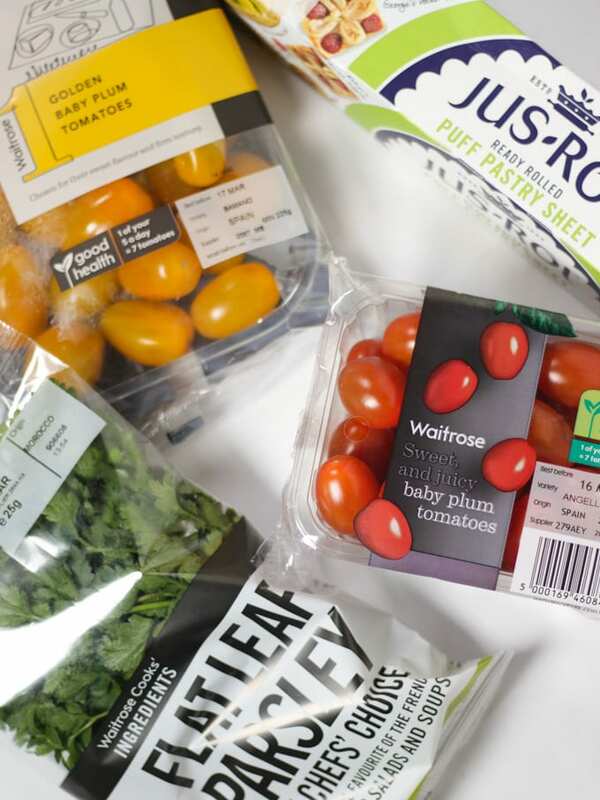 This is the final Waitrose & Partners Beautifully Simple recipe I’ve tested this week and it fits perfectly with my easy veggie dinners mission. These are in store recipe cards, focussing on quick and healthy meals that are #BeautifullySimple. This is the third of these cards I’ve tried and I was super impressed. This Easy Fish Pie with Cheesy Mash was the first and Chicken Wrapped in Bacon the second. 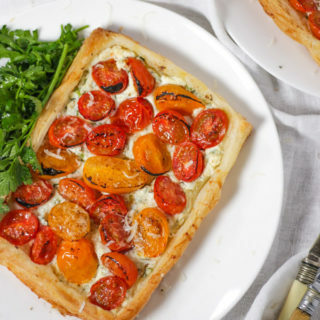 It uses simple cheats (like ready made puff pastry in this recipe) to make life a little easier. We all WANT to cook from scratch all the time, but honestly, I’m all for making some compromises midweek. 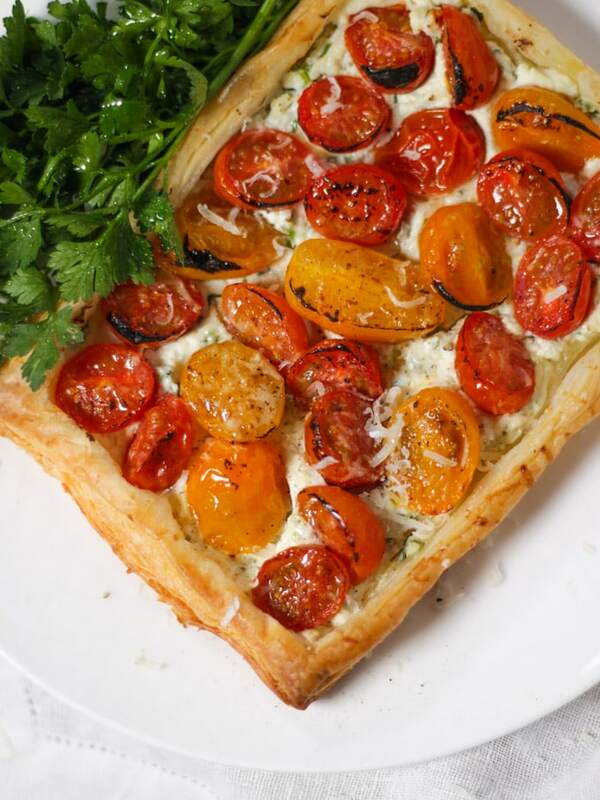 You can find this recipe cards ‘Mixed tomato and cheese tartlet’ in Waitrose & Partners stores now. How do you make a Puff pasty tart? The beauty of this Puff Pastry Tart recipe is it looks so impressive, but its actually so simple, using ready made puff pastry really removes all of the hassle but the end product looks and tastes just as good. Firstly roll your pastry out (if you’re not using the ready rolled puff pastry, roll your pastry to 1cm thickness). Using a knife score a 0.5-1cm border around the edge of each one. Mix the ricotta with almost all of the grated cheese and the finely chopped stalks from the parsley. Spread this mixture over the tarts avoiding the borders. Now scatter the halved tomatoes over the top in a densely packed overlapping layer, season and drizzle with a little oil. Sprinkle the remaining cheese on top and bake for 20-25 minutes until the pastry is puffed and golden. Can you make a Puff Pastry tart ahead of time? 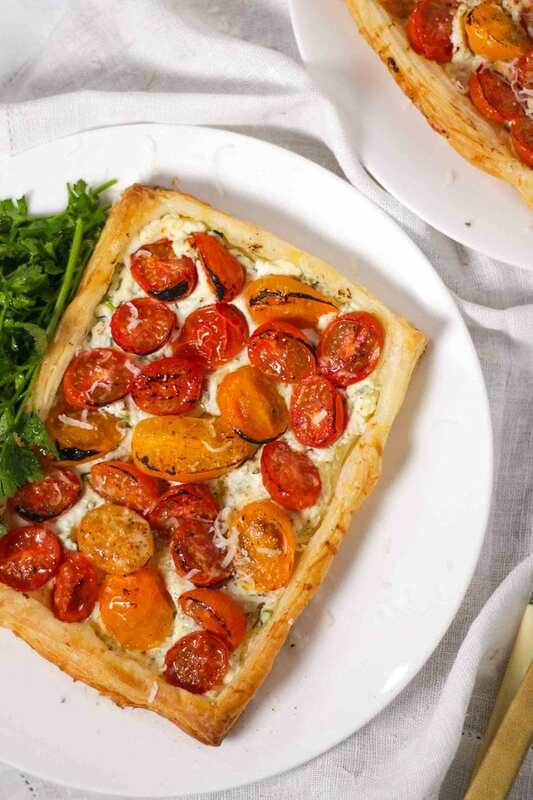 The beauty of this tart is that you can assemble it around 24 hours before you want to cook it and it’ll still be perfect. This makes it a great dish to serve when entertaining, or a perfect prepare ahead dinner party starter. 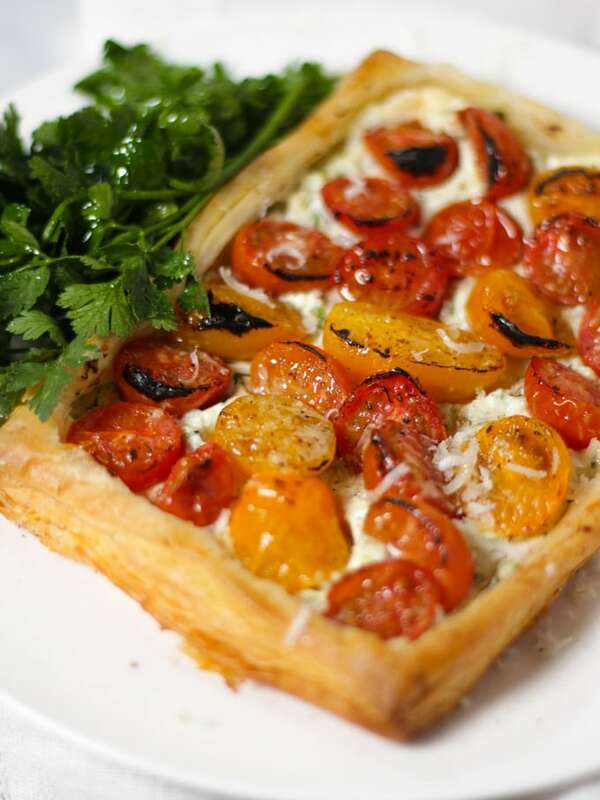 Can you refrigerate a Puff Pastry tart after baking? 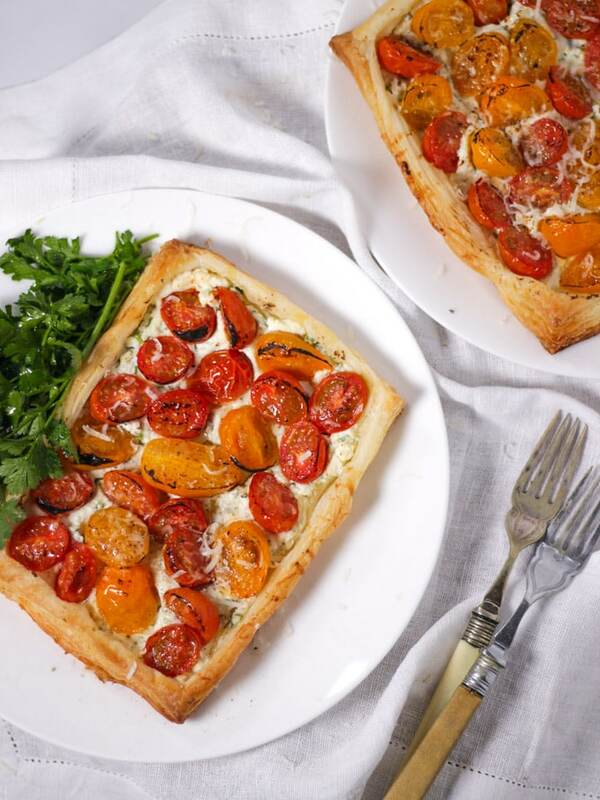 This Puff Pastry Tart is best eaten as soon as it is cooked for maximum deliciousness. You can store it in the fridge for later, but it won’t be quite as crispy and flaky. If you wanted to make mini versions of this, as Puff Pastry Tartlets, cut up your pastry into smaller squares and press into oiled muffin tins before filling and baking. These would make a delicious after school snack or easy canapé. To make the border of your puff pastry tart extra crispy and shiny, brush it with a beaten egg just before baking. I often serve this to my children with a variation on fillings as a Puff Pastry Pizza. It is so simple and they love it. To make this recipe vegetarian you should substitute the Pecorino for a vegetarian Italian hard cheese – this should be available in most supermarkets. If you are Gluten Free – Jus Rol now make a ready made gluten free puff pastry too. 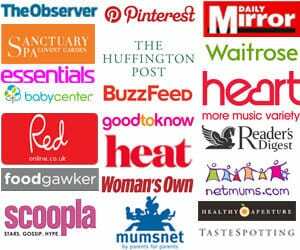 If you would like some more vegetarian recipes for Meat Free Monday inspiration have a look at my Butternut Squash Curry and Broccoli and Cauliflower Soup recipes. Hope you enjoy this recipe as much as we do. 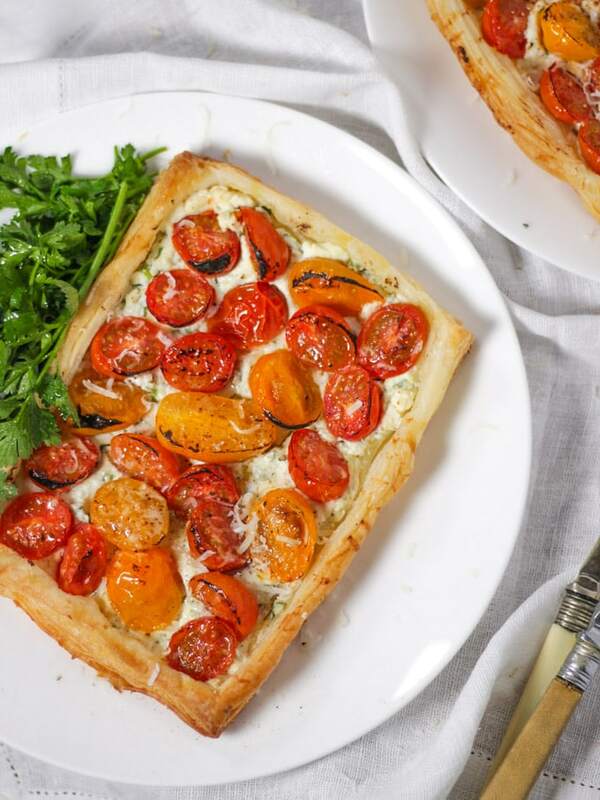 I’d love to know how you got on and what you thought of it if you make this Puff Pastry Tart with Tomato and Ricotta. Please rate the recipe and leave me a comment below if you do. 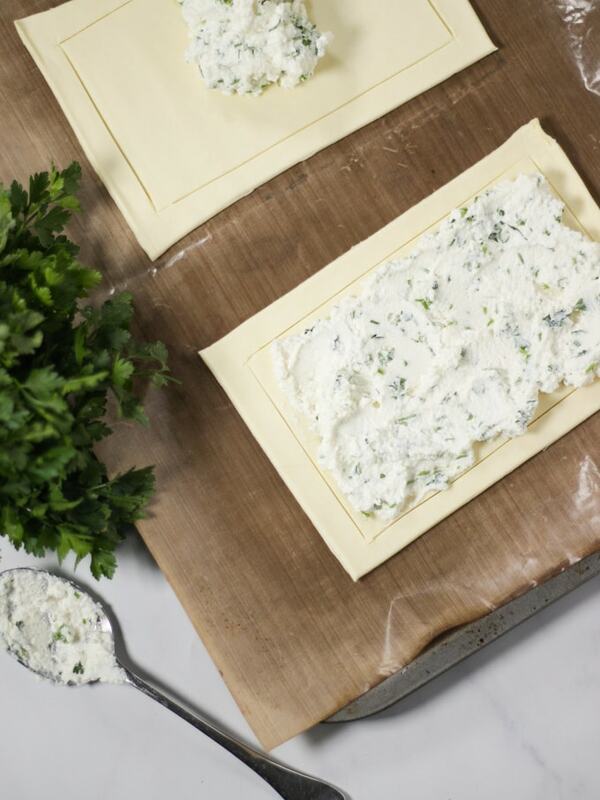 Lay the pastry, together with the baking parchment it comes with, onto a baking tray. Using a knife, cut the pastry neatly in half. Score a 0.5-1cm border around the edge of each one. Mix the ricotta with almost all of the grated cheese and the finely chopped stalks from the parsley. Spread over the tarts avoiding the borders. Scatter the halved tomatoes over the top in a densely packed overlapping layer, season and drizzle with a little oil. Sprinkle with the remaining cheese. Bake for 20-25 minutes until the pastry is puffed and golden. Meanwhile, mix the olive oil and balsamic glaze together. Season with salt and pepper. Toss with the parsley leaves. Serve with the hot tartlets alongside freshly cooked new potatoes. « Nutella Brownies – Just 3 Ingredients!